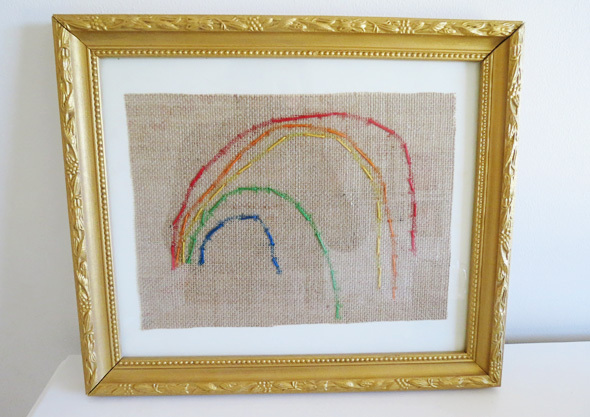 Immy and I enjoyed working together to make this simple stitched rainbow to hang in her room. 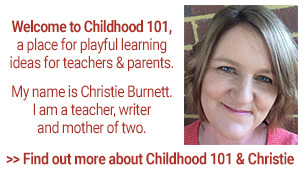 It is a great introduction to learning to embroider for kindergarteners (with guidance) or school aged children. 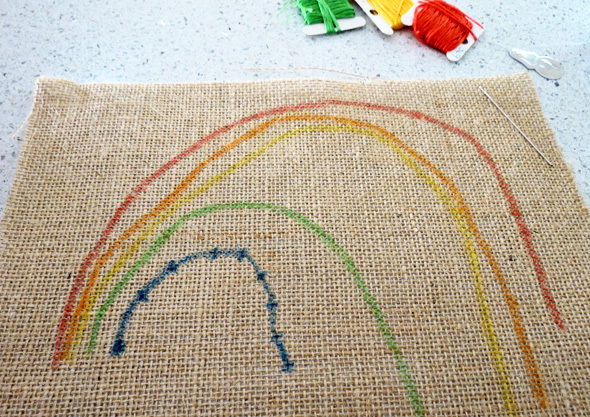 Have your child draw a rainbow (or other simple shape) directly onto the hessian with the markers. 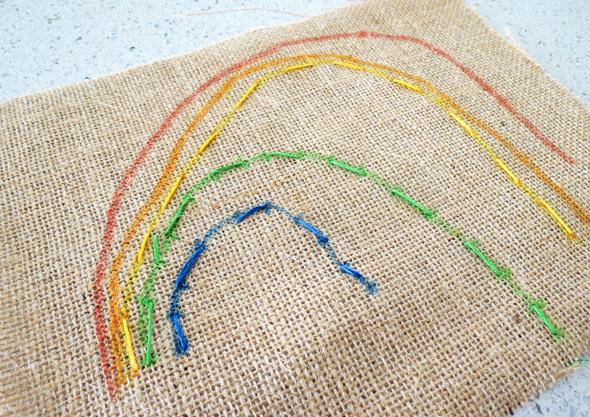 Make small marks periodically along the lines to be stitched. 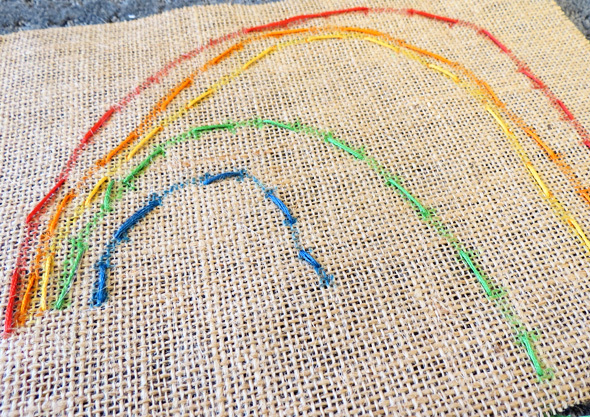 These will form a guide for your child’s needle as they are forming the running stitch. Optional ~ place the hessian onto an embroidery hoop to hold it taut. 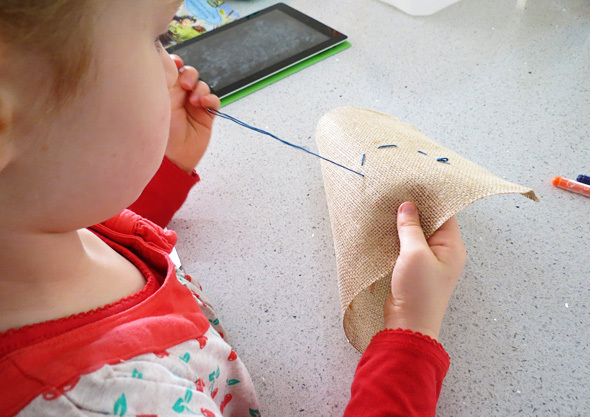 This can make sewing much easier for children, especially those who are not familiar with sewing activities. 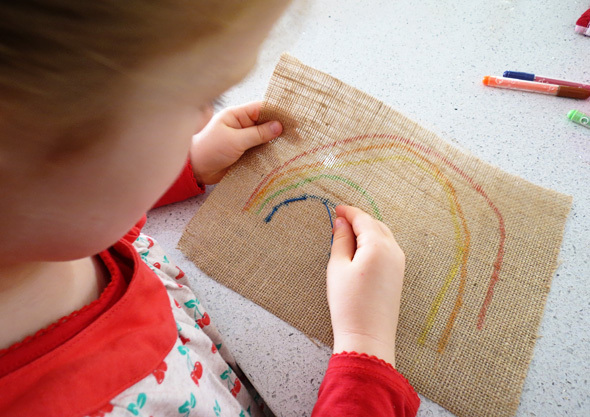 Show your child how to form each stitch by coming up through the hessian on one mark and back down through the hessian on the next. Show them how important it is to pull the needle and thread through until it is taut. It can be helpful to tie the thread to the needle so that it is not accidentally pulled off. 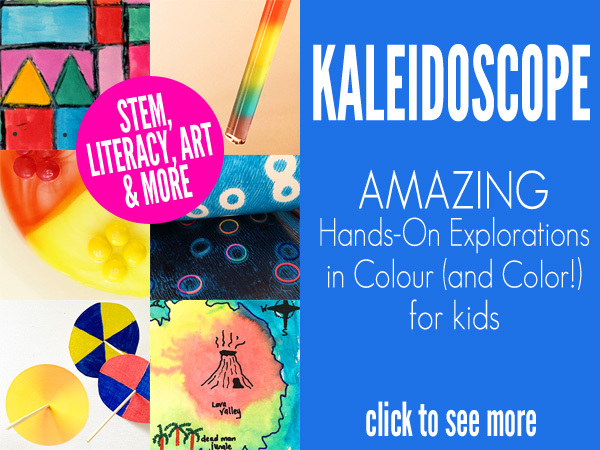 Alternatively, show your child how to hold the needle so that the thread is tight between their thumb and forefinger to reduce the likelihood of it being pulled off. The most difficult part of the process is bringing the needle up from the back in the correct position to form the next stitch. It takes patience, practice and, most likely, guidance from an adult to hit the mark each time. 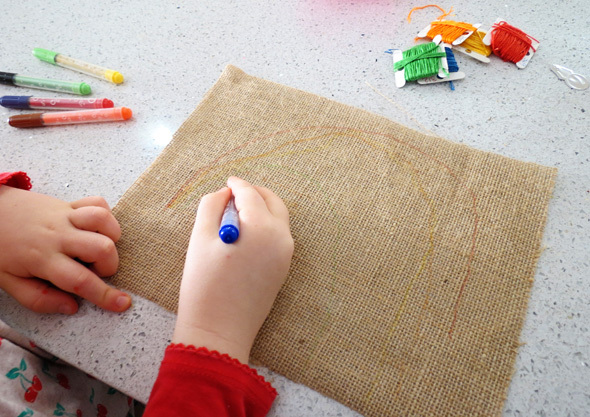 Immy is now four and a half and is very familiar with sewing activities. Even so, this was created over a number of sewing sessions according to her interest each time. There are also ‘mistakes’ where she missed some of the stitch marks but I believe this just illustrates part of the process of learning, offering a teachable moment to learn from for next time. 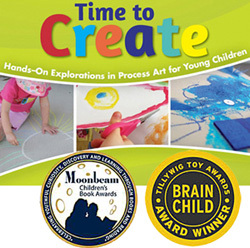 If you are unsure if this type of craft is suitable for your child you might find this post helpful, Is this Kids Craft Idea Right for my Child? For other simple kids sewing activities, check out our Toddler Sewing Basket, Sewing Buttons, Sewing Flowers and Sewing Outlines. What I really love about this is that you had her draw her own picture first and then embroider it. 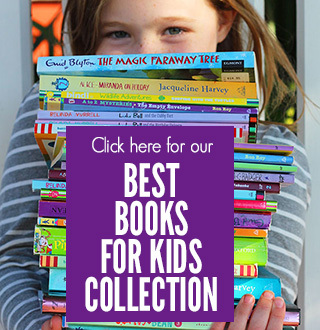 Great idea--I will try that with my kids. wow ! that is so beautiful and effective ! 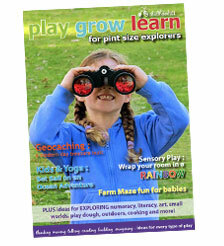 Such wonderful handwork for little ones. And she did a great job of it, it is beautiful and lovely to have it displayed! 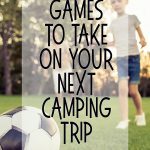 This is wonderful, sewing is not something I have done much of with my girls and you have prompted me to add it to our regular activities now. Love the finished product, bet it looks great hanging on her wall! That is so (sew!) cute. 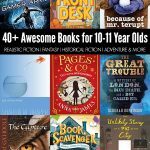 My two are a little young for this at the moment but I will be storing the idea away for a few years time. I have a niece who is crazy about craft but hasn't done much sewing so I will give it a go with her. This sounds like something she would love. The end product looks great and I would be very happy having it hanging in my house - would brighten up any room and look fab in a kids bedroom. 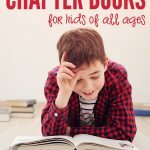 What an awesome idea thanks for sharing! Great idea! I did a search and it looks like they're called "plastic canvas" sheets in the needlepoint section of a craft or art supply store.